I havent used the bits yet but looks like there is a lot of potential. Great set of bits and a great price. I have only use two but they work perfect on my project. I build and design theater sets so the bit will be put to good use. Buying individual router bits is very expensive and the one you need NOW isn't in your collection. 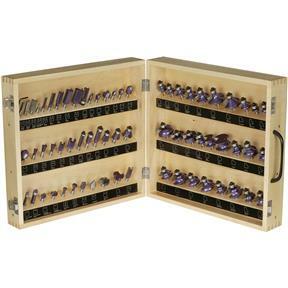 This 66 piece set has a great variety of standard bits, in different sizes. I've used a few and found they worked perfectly. I can't talk about wear yet, but the price is right and it's a real luxury to have this variety close at hand. Nicely packaged and convenient. It is a nice kit. The only problem I had was the box that holds the bits needs to be beefier. The hinges on the box broke the 3rd time I opened it. I bought this router bit assortment because it has most of the common bits that woodworkers use. I had the same set years ago but had to sell it because of a divorce, and I had always wished I had kept it. Many times since then I had need for some of those bits so I just decided to buy a new set, and I'm glad that I did. This is a great assortment with a nice case and anyone who buys one will be glad they have them.